July 21, 1985, J. P. Pelham. 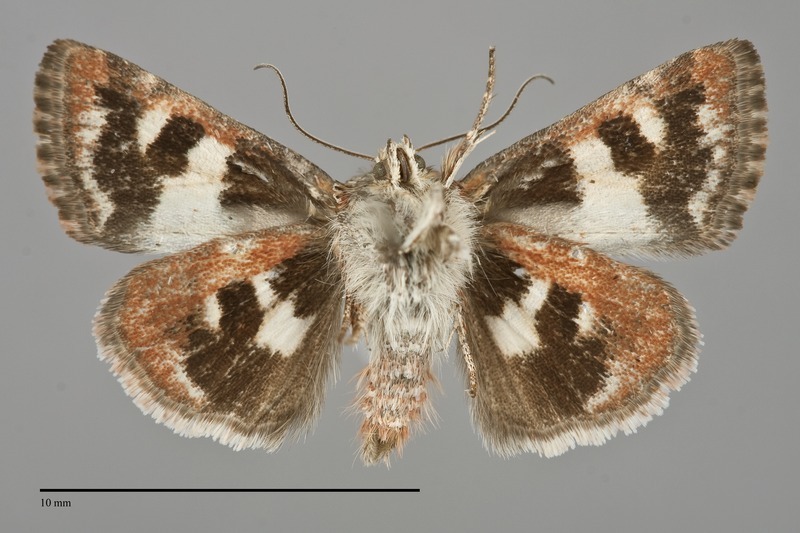 Schinia vacciniae is a small (FW length 9 - 10 mm) day-flying moth with a forewing with a black base, wide cream median area with a brown reniform spot, and mottled warm brown edge, and a black hindwing with a white median area that flies in the Cascade Mountains during the summer. The ground color of the median area is cream, slightly orange-brown lateral to the median line and gray on the costa. The base to the antemedial line is brown-black, the subterminal area is dark orange-brown, and the terminal area and fringe are lighter orange-brown. The basal line is a short pale mark on the costa. The antemedial line is dark gray followed by white, slightly irregular, weakly excurved with a notch toward the base above the trailing margin on vein 1A+2A. The postmedial line is gray, double with cream filling, weakly scalloped, and S-shaped with an excurved segment toward the outer margin opposite the cell and a concave segment toward the base on the lower half of the wing. The subterminal line is cream, irregular, with a row of dark spots preceding it in the distal subterminal area. The reniform spot is figure-eight shaped, filled with gray peripherally and orange-gray centrally. The other spots are absent. The hindwing ground color is white, divided into larger medial and smaller lateral spots by the large black discal spot. The base, inner margin, and marginal band are black with well-defined edges. The head and thorax are gray. The eye is reduced in size. The male antenna is filiform. 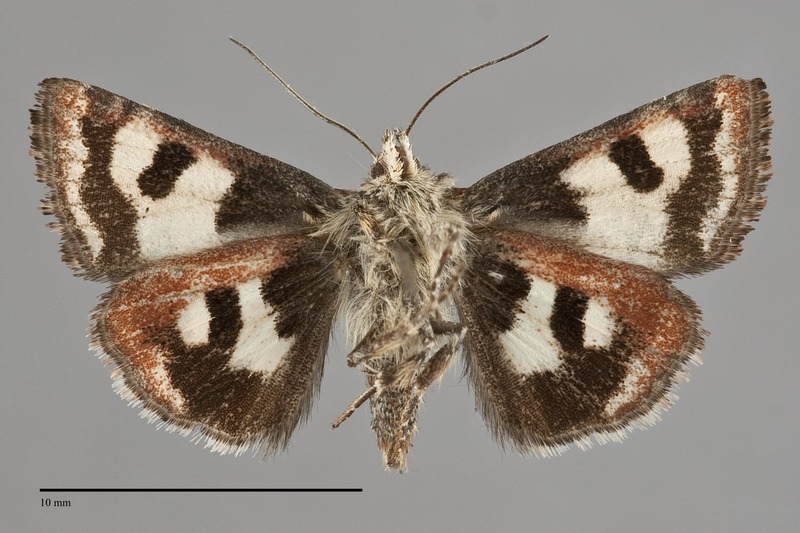 This species can be identified by its dark forewing with wide cream-colored median area and a warm orange cast in combination with a black and white hindwing. The burnt orange color is evident on the ventral hindwing. No other day-flying moth from the Cascade Mountains has a similar pattern. This species occurs in open mountain meadows at middle to high elevations. It is usually rare and sporadic in distribution. 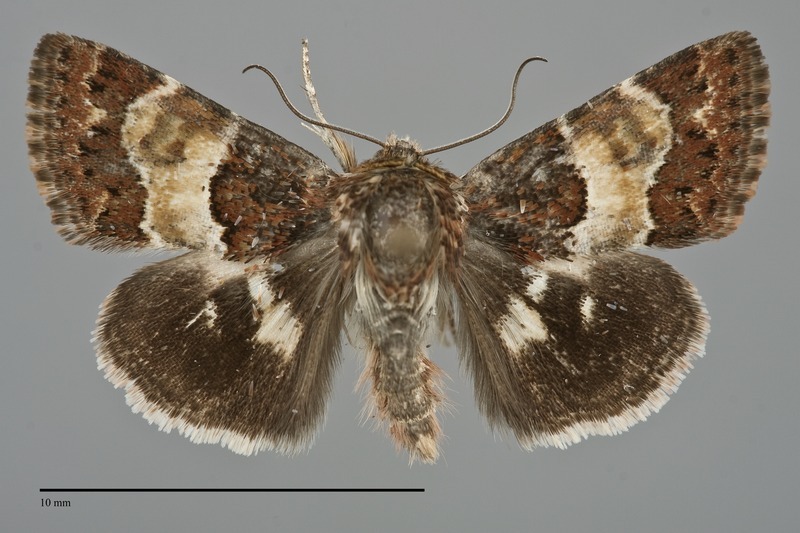 This species is found in the Cascade Mountains of Oregon and Washington as far north as Mt. Rainier and Chelan County in Washington. It has been discovered recently in west-central Idaho. This species is found in the Cascade Mountains, Sierra Nevada, and Transverse Ranges of California outside of the Northwest. No information is presently available regarding larval foodplants of this species. 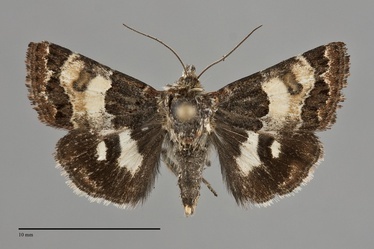 Hardwick (1996) notes an association of this moth with the flowers of Chrysothamnus and Haplopappus in the Asteraceae. It is associated with a purple Aster species in Idaho. Fleabanes (Erigeron spp.) in the Asteraceae are the suspected foodplant in the Cascades based on habitat association and closely related species. Adults are diurnal and visit flowers during the day. The flight time is summer, with records from July in the Northwest.